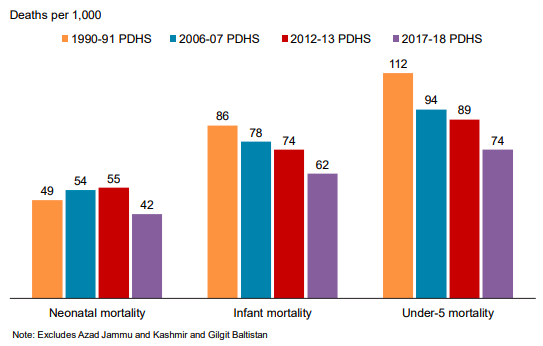 The latest national health survey in Pakistan indicates rising immunization rates, growing access to skilled health care and declining child mortality rates. However, the improvements in education and health care indicators in Pakistan are real but slower than in other countries in South Asia region. Pakistan's human development ranking plunged to 150 in 2018, down from 149 in 2017. It is worse than Bangladesh at 136, India at 130 and Nepal at 149. The decade of democracy under Pakistan People's Party and Pakistan Muslim League (Nawaz) has produced the slowest annual human development growth rate in the last 30 years. The fastest growth in Pakistan human development was seen in 2000-2010, a decade dominated by President Musharraf's rule, according to the latest Human Development Report 2018. One of the biggest challenges facing the PTI government led by Prime Minister Imran Khan is to significantly accelerate human development rates in Pakistan. PDHS (Pakistan Demographic and Health Survey) is a nationally-representative household survey that provide data for a wide range of monitoring and impact evaluation indicators in the areas of population, health, and nutrition. It is conducted about every 5 years. The 2017-18 Pakistan Demographic and Health Survey (2017-18 PDHS) was carried out by the National Institute of Population Studies (NIPS), Islamabad, Pakistan. It involved 16,240 households. ICF provided technical assistance through The DHS Program, a project funded by the United States Agency for International Development (USAID) that provides support and technical assistance in the implementation of population and health surveys in countries worldwide. The infant mortality rate (IMR), defined as the number of deaths in children under 1 year of age per 1000 live births in the same year, is universally regarded as a highly sensitive (proxy) measure of population health. A declining rate is an indication of improving health. IMR in Pakistan has declined from 86 in 1990-91 to 74 in 2012-13 and 62 in the latest survey in 2017-18. During the 5 years immediately preceding the survey, the infant mortality rate (IMR) was 62 deaths per 1,000 live births. The child mortality rate was 13 deaths per 1,000 children surviving to age 12 months, while the overall under-5 mortality rate was 74 deaths per 1,000 live births. Eighty-four percent of all deaths among children under age 5 in Pakistan take place before a child’s first birthday, with 57% occurring during the first month of life (42 deaths per 1,000 live births). Vaccines are proven to prevent infectious disease and spread of such disease among children and the larger populations. Polio, measles, diphtheria, pertussis (whooping cough), rubella (German measles), mumps, tetanus, rotavirus and Haemophilus influenzae type b (Hib) can now be prevented by vaccination. 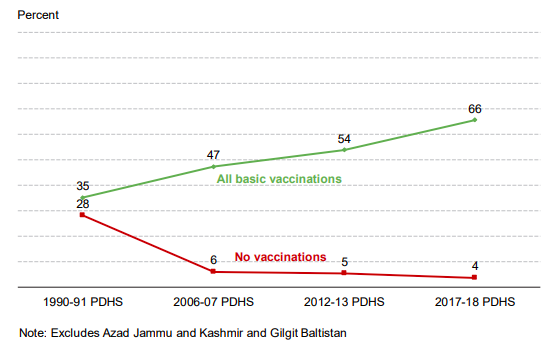 The latest PDHS survey indicates that 66% of the children in Pakistan have received all basic vaccinations, up from 35% in 1990-91 and 55% in 2012-13. Only 4% have had no vaccinations, down from 28% in 1990-91. Access to proper medical care and hygiene during delivery can reduce the risk of complications and infections that may lead to death or serious illness for the mother, baby, or both (Van Lerberghe and De Brouwere 2001; WHO 2006). PDHS survey data show that in Pakistan, 69% of the births in the 5 years preceding the survey were delivered by a skilled provider, and 66% were delivered in a health facility. There has been steady improvement of the maternal health care indicator for women receiving ante-natal care (ANC) from a skilled provider, which increased from 26% in 1990-91 to 86% in 2017-18. Similar improvement in the percentage of deliveries at health facilities has been witnessed; these deliveries increased from 13% to 66%. 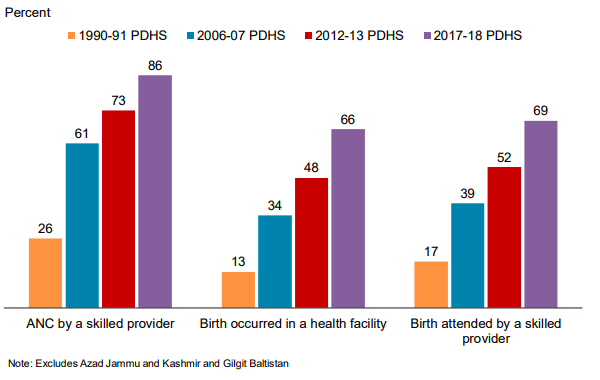 Also, the percentage of births attended by skilled providers increased from 17% to 69% over the same period of time, according to PDHS 2017-18. 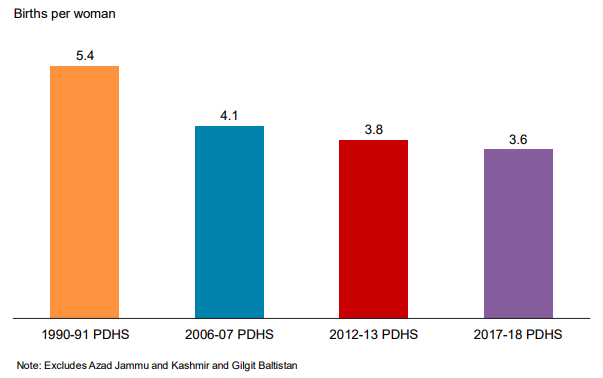 Pakistan has seen a steady decline in fertility rates over time, from 5.4 births per woman as reported in the 1990-91 PDHS to 3.6 births per woman in the 2017-18 PDHS—a drop of about two births per woman in almost three decades. However, the decline is minimal in the recent period. There has been a consistent decrease in fertility among all age groups over the last four DHS surveys, though the decline is less pronounced recently. It appears that improvements in education and health care indicators in Pakistan are slower than other countries in South Asia region. Pakistan's human development ranking plunged to 150 in 2018, down from 149 in 2017. It is worse than Bangladesh at 136, India at 130 and Nepal at 149. The decade of democracy under Pakistan People's Party and Pakistan Muslim League (Nawaz) has produced the slowest annual human development growth rate in the last 30 years. 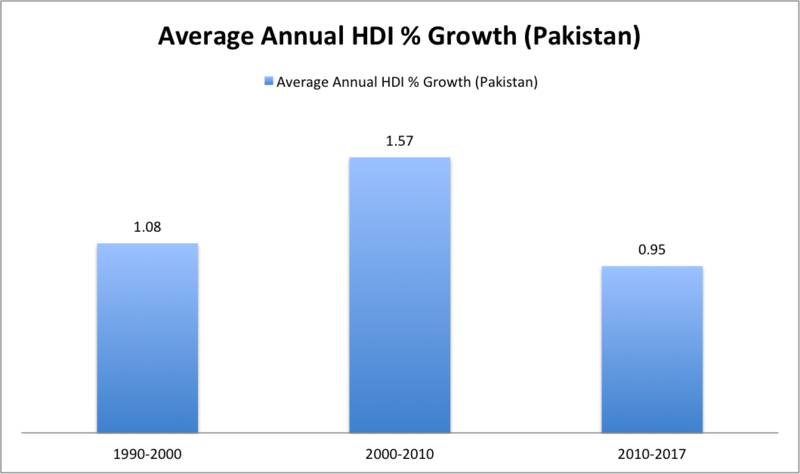 The fastest growth in Pakistan human development was seen in 2000-2010, a decade dominated by President Musharraf's rule, according to the latest Human Development Report 2018. PDHS survey shows that the nutritional status of children in Pakistan has improved over the last five years. The percentage of stunted children declined from 45% in 2012-13 to 38% in the 2017-18. 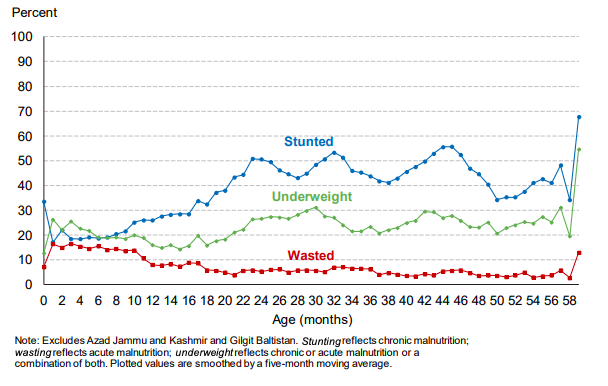 A similar downward trend, from 30% to 23%, was observed for underweight children over the same period. Children who are wasted also declined from 11% to 7%. Children who are obese remained at 3% over this period. There are rising vaccination rates and growing access to skilled health care with declining child mortality in Pakistan, according to the latest national health survey in Pakistan. Neonatal mortality rate is down from 55 to 42 per 1,000 births in the last 5 years. Vaccination rates are up with 66% of the children in Pakistan having received all basic vaccinations in 2017-18, up from 35% in 1990-91 and 55% in 2012-13. Only 4% have had no vaccinations in 2017-18, down from 28% in 1990-91. Skilled health care professionals are delivering 69% of children now, up from 48% five years ago. 66% of children are now vaccinated, up from 54% five years earlier. Infant mortality rate (IMR) within first year of birth was recorded at 62 deaths per 1,000 live births, down from 74 in the last survey of 2012-13. Total Fertility Rate (TFR) has declined from 5.4 births per woman 990-91 to 3.6 births per woman in 2017-18. It appears that improvements in education and health care indicators in Pakistan are slower than other countries in South Asia region. Pakistan's human development ranking plunged to 150 in 2018, down from 149 in 2017. It is worse than Bangladesh at 136, India at 130 and Nepal at 149. The decade of democracy under Pakistan People's Party and Pakistan Muslim League (Nawaz) has produced the slowest annual human development growth rate in the last 30 years. The fastest growth in Pakistan human development was seen in 2000-2010, a decade dominated by President Musharraf's rule, according to the latest Human Development Report 2018. One of the biggest challenges facing the PTI government led by Prime Minister Imran Khan is to significantly accelerate human development rates in Pakistan. Its a very mediocre performance, especially when it comes to health metrics like infant mortality, stunted growth, and so on. Pakistan needs to see significant improvements in these areas and need it FAST. The only good part is healthy fertility rates that Pakistan has been able to maintain (3.4 children per woman is quite healthy! Pakistan should bring down the TFR gradually to 3 and then 2.5 etc by 2040, and 2.2 by 2050 etc. Sudden drop in TFR is in quick time is disastrous for developing countries like Pakistan. That's why Iran is trying so hard to increase its fertility now after sudden drop of 1990's). Immunization rates have shown some promise, but the momentum needs to continue there at full speed as well. Infant mortality of 62 is progress but India is at 31. This is the primary reason why Pakistani life expectancy lags a bit behind India. Getting infant mortality down to 20 should be a screaming priority of the government. TFR also needs to be brought down to under 2.5 so we can slow population growth. Population is on track to hit 300 million, and going much beyond that is not a good idea. The child mortality in Pakistan (between age 1 and 5) is actually pretty low and a bit better than India. Getting all those children educated to a decent standard for a modern economy is also a must. And yet, the nation has an abundance of food – in fact, according to the US Department of Agriculture, Pakistan is projected to export 500,000 tons of wheat from May 2018 until April 2019, and 7.4 million tons of rice in the same period. The issues are socio-economic, experts said – just because goods are available does not mean people can access them. “There are four key pillars of food security in Pakistan: the first is availability, then accessibility, utilisation and stability,” said Ambreen Fatima, senior research economist at the Applied Economic Research Centre of Karachi University. In Tharparkar district, where Mithi Civil Hospital is located, all four are lacking, she said. “This is also linked to inadequate water and sanitation, education and health service delivery, which together with the lack of awareness of appropriate dietary intake contributes to greater food insecurity and malnutrition,” it said. Tharparkar district is frequently highlighted in Pakistan’s media because of its high rate of child deaths, with politicians blaming the situation on drought – but economists and physicians said that was not the sole explanation. “Causes of malnutrition are multiple pregnancies, young-aged marriage, iron deficiency in mothers, (lack) of breastfeeding, weak immunisation, and early weaning,” Kumar said. Many mothers are told to feed their newborns tea, herbs, which can stunt growth. Some are unnecessarily persuaded to use formula instead of breast milk by doctors. The premier announced that a cancer institute will be made with the help of Pakistan Army and the provincial government. Speaking about the Quetta-Zhob Dual Carriageway, the premier said it was a difficult project. "The Quetta-Zhob Dual Carriageway will connect the province to other parts of the country," he said. "We also needed to pay attention towards the western route," PM Imran said and added that the government wishes to make a railway track from Quetta to Taftan and Railways Minister Sheikh Rashid is making efforts in this regard. "We need to make a master plan for Quetta," he urged while stating that Pakistani cities are expanding. "As cities expand, people will not be able to receive facilities and will face more difficulties." PM Imran further said that under CPEC, the western route should have been made first. "The country also faces water issues for which we are building a dam. We do not want to think about other elections but our country's progress," he asserted. "If Balochistan is focused on then the whole country will progress," he stated. Prime Minister Imran Khan also launched work on New Gwadar International Airport and announced various other development schemes for the city, what he believed would become an engine of growth for Pakistan. “What a pleasure it is to be in Gwadar. In sha Allah, in coming months, years, Gwadar would be, I see, as engine of growth for Pakistan,” he said addressing the ground breaking ceremony of the airport. The event was attended by federal ministers, Balochistan chief minister, parliamentarians, Chief of Army Staff General Qamar Javed Bajwa and Chinese Ambassador to Pakistan Yao Jing, besides huge number of Chinese workers and government officials. The airport was included among Early Harvest High Priority Project of the CPEC in January 2014. The Chinese government would assist Pakistan in construction of the airport under Chinese Grant Assistance. The project is part of overall infrastructure development of Balochistan. It would be developed as a green-field facility with all modern facilities for safe operation. The new Gwadar airport would be able to accommodate large aircraft such as Airbus A380. It would comprise a modern terminal building with cargo terminal having initial handling capacity of 30,000 tons per year. Khan said it was pleasing that the capacity of the hospital in Gwadar would be enhanced and a vocational training institute would also help create employment opportunities. He announced to launch Insaf Sehat Card to provide health insurance cover worth Rs720,000 to every family. The premier said previously power was being transmitted from Iran, but now the government had decided to link the area with national grid. A desalination plant would also be set up in the city and under Clean and Green Pakistan, one million saplings would be planted. Besides, a solid waste management system would also be established to protect the area from pollution, he said.